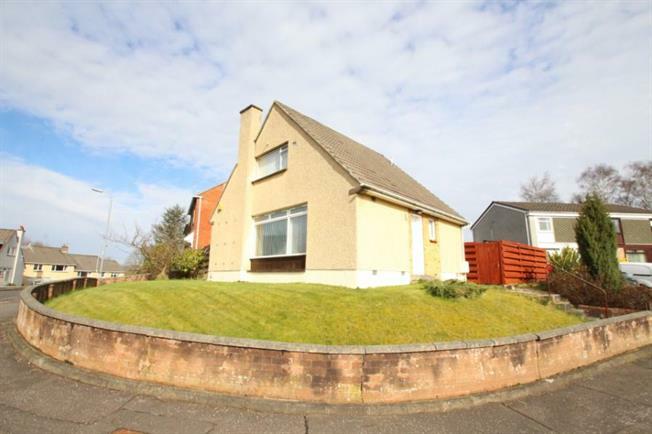 3 Bedroom Detached House For Sale in Glasgow for Offers Over £245,000. A very impressive detached villa in a lovely Lenzie location with driveway parking extending to a detached garage , occupying a splendid plot with a secluded rear garden within this quiet cul-de-sac. The ground floor accommodation comprises reception hallway, spacious lounge open plan to the dining area which has french doors providing access to the rear garden, L-shaped breakfasting kitchen with wall and base mounted storage units , space for a table plus chairs and outer door leading to the rear garden. Bedroom three completes the accommodation downstairs. The upper floor comprises two double size bedrooms and a large bathroom with three piece suite with shower over bath. Further benefits include Single garage and driveway parking, Gas central heating system, Double glazed windows. The fully enclosed rear garden is well presented with a lawn and patio area. The property lies within the catchment area of the reputable Lenzie Primary School and Lenzie Academy. Lenzie train station is situated within a short walk of the house. EER Band E.